Being prepared is something that I’m well known for with all of my friends and family – I’m called Mr. Redundancy. This last weekend, it helped to save our lives when we were stranded in the wilderness with minimal survival gear in deep snow and 15 degree temperatures. This is a story of how technology and being prepared helped us survive a very serious situation. It also reinforces how important preparedness is everywhere – at home, on vacations, in the wilderness, and on the water. We had gone up the hill the day before with my brother on snowmobiles and had a great time. One had an engine problem and had to be towed back, and the snow was deep, but great fun. 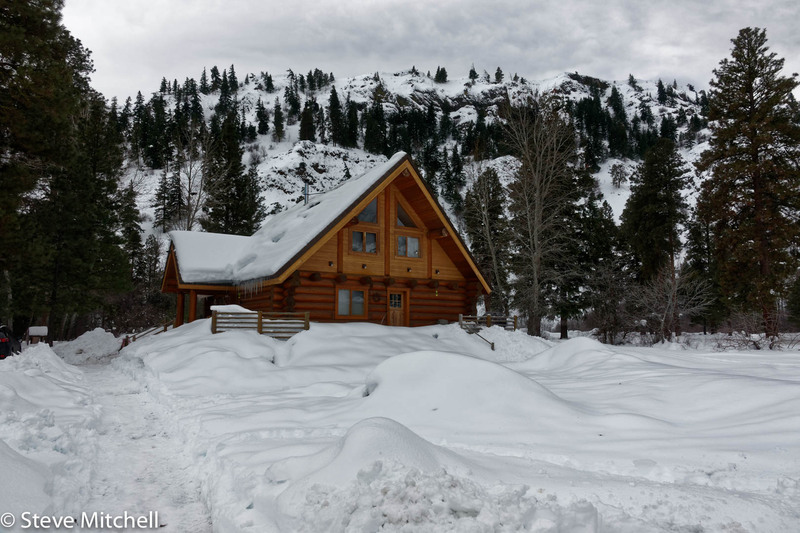 Monday, February 13th started out like any other day at the family cabin near Naches, Washington. Good friend Jake and I both had planned on going back up the hill on our own on the snowmobiles. 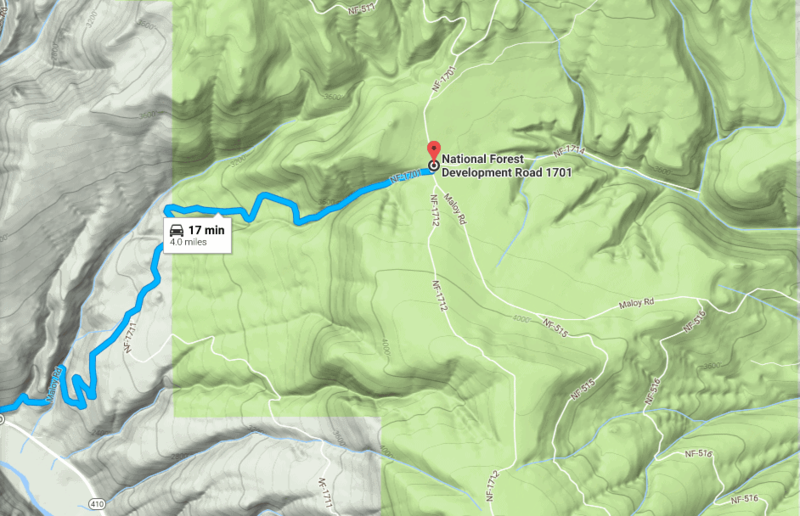 We left the cabin around 11:00AM and headed up Bald Mountain Road, also known as Forest Road 1701, and reached the main intersection about 4 miles up the hill 20 minutes or so later. Based on the previous day’s experience, we decided to take a left and continue on Forest Road 1701. The day before we had explored some of the large flat areas that my brother had ridden in many times before, and I had gotten stuck once pretty bad because of the depth of the snow. I wanted to go further up FR 1701 and fly my new Mavic Pro drone where there are spectacular views of Mount Rainier and the valley below. This last summer, Jake and I had driven up to this very area several times and flown the drones, done some target practice, and explored the forest fire aftermath that happened near Rock Creek. I knew it pretty well and felt comfortable with the area. After winding a couple more miles up FR 1701, I took a left on a road that Jake, Josh and I had walked out during the summer. It had a great wide open area at the end of the main part of the road that you could see Mount Rainier from, and a lot of space to turn around. The initial part of the road seemed OK, although clearly no one had been down it since the last big snow. That worried me a little, but I was confident that we could turn around and come back out without any problems. About 1/4 mile down the road, things started getting deeper than I would like, and I decided to turn around. I was riding my brother’s Polaris 800 snowmobile, a very powerful “hill climbing” style machine. I had difficulties in the past making sharp turns, and had learned that leaning off the machine with your body weight and gunning the throttle usually got the job done. Unfortunately when I tried to turn around this time, I did everything wrong and got it stuck on a rather steep hill with snow that was about 6′ deep. I did the same thing the day before, and Scott warned me against doing anything on an uphill. This particular spot was also very exposed, and probably had even more snow than the rest area because of that. The snow was so deep, and the machine stuck really deep as well, that I had to ask Jake to come over and help me. The snow was so deep that it took him 10+ minutes just to make it over to me about 50 feet away. This will become even more limiting later in the day. After several attempts to get unstuck pointing uphill, we decided to dig and flip the machine around pointing downhill. Keep in mind, the Polaris 800 RMK weighs in at 408 pounds, dry weight, without fuel and gear. 408 pounds. This will become another limiting factor later in the day. It took both of us lifting the back end of the machine around in a circle, and I was able to drive down the hill, but unfortunately, I was pointed the wrong way. In the picture above you can see Jake on his machine, a much smaller Polaris 440, and my track off of the first place I got stuck. The snow does not look deep, but that is deceiving – it was at least 6′ deep here. At this point, Jake made a complete U-turn and was able to go around a nearby tree in a circle, making sure he could turn around. I was pointed further down the road, the wrong way – my options were much more limited than Jake. He had flat areas all around him, while I had a very steep hill to my left and right, with the upper one having what looked like a cornice and a steep drop off – not something I wanted to ride up and find out what was on the other side. 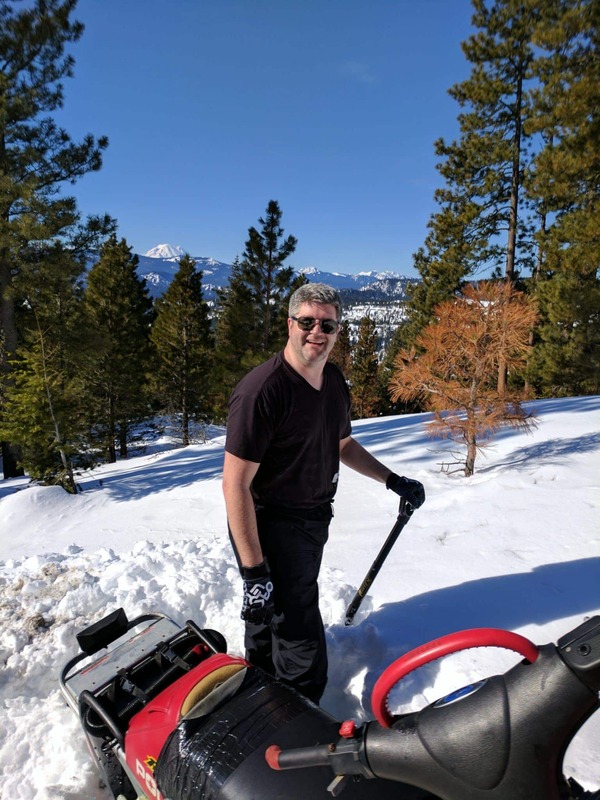 Turning the machine around by hand would have been a 30+ minute struggle, as standing in 6′ of snow without snowshoes is impossible. It would also take Jake at least 20 minutes to get to me – it doesn’t look that far away, but trust me when I say it would take that long. So after a lot of discussion, I decided to continue down the road to what I remember being a wider open space and meadow where I could more easily turn around. Jake would wait where he was until he saw me come back, or come down and find me if he heard my engine go off, or after 10 minutes. This would be another fateful decision. I started down the road, and after turning the corner and losing sight of Jake, I knew I was in over my head. The snow got even deeper, and I was having difficulty controlling my machine. Just to keep it from bogging down, I had to go very fast, and I started losing the road track. I tried turning left and right in the wider area I was at, and the machine continued to bog down and not want to turn. After another 1/2 mile of this, I saw a more open spot, and started to turn around a tree on my left. Almost immediately, I knew I was in trouble. I tried to accelerate and leaned way off the machine with my left foot dragging in the snow, but the machine wouldn’t turn. But I was committed. What I didn’t know was that behind the bushes and tree was a steep drop off into a bowl. I went over. Fast. The next few minutes are still a blur, but I remember threading through two sets of trees where my machine had almost no clearance, trying to turn uphill many times, but failing, and going down, down, down deep into a bowl. I finally was able to turn right pretty sharply, and below me saw an even deeper and steeper ravine that I was headed for, along with even deeper snow. I was able to make the turn and point back uphill, but the machine bogged down. I was stuck. Again. I had traveled about 500 feet down a very steep hill into a bowl, and I could barely see the blue sky above the ridges surrounding me. I knew I was in big trouble based on where I was, and that the likelihood of getting the machine out was very low. Over the next 15 minutes I tried to get the machine unstuck, completely running on adrenaline and thankful I hadn’t crashed coming down the hill, but freaking out inside my mind that I was really in a jam. A few minutes later, I heard Jake’s machine – he was following my path, as we agreed. I hoped he would see the crazy tracks of my machine, and stay on top of the ridge. My hope was not long lasted, as I soon saw him barreling down the same hill I did, a bit out of control himself, threading the same trees and obstacles that my adrenaline fueled brain had done only a few minutes before. I got on top of my machine and screamed at him to stop, made the universal signs for stop in as many ways as I could think (crossed arms, waving him away, etc.) but he still made it down and into the bowl near me, about 50 feet away. He stopped and his machine was not stuck, but he was still freaked out at having essentially fallen down the hill track with his machine. I started to try to get my machine un-stuck, but it quickly became apparent that I was in bigger trouble than I expected. The snow was so deep that every time I stepped, it would go up beyond my groin area, essentially trapping me. Trying to dig out my machine just became far more difficult. My first attempt at digging out, Jake was watching – he was 50 feet away, which would have taken him 10-15 minutes to get to me in this deep of snow. We did not have snowshoes. I got things as dug out as possible, and tried to move, only to have the machine jump forward a bit, and dig in even deeper. At this point the back track was nearly 4′ deeper than the front of the machine. The next strategy was to dig out all around the machine – including a 10′ track in front of the machine to allow for it to have a better chance moving forwards. This attempt resulted in getting further up the hill by about 15 feet. Progress! Keep in mind, though, that I am now moving around a 408 pound machine on my own. I am running on adrenaline, and I know it won’t last forever. Time to unstick the machine the second time. This time I was stuck on a log – it was clear that they had logged or done some work here as a result of the Rock Creek forest fire earlier in the year. Same strategy, got further up towards Jake. Third time was similar. Still lifting the damn thing by myself, cursing and swearing, but feeling good about our chances. 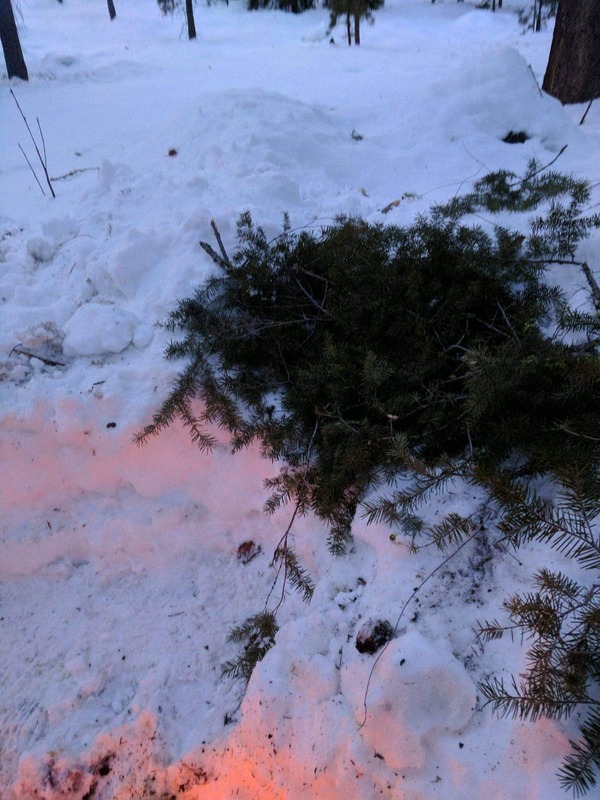 The fourth time was not as good – after digging out, I started moving more than any other time, got close to a tree that hit me in the face (I was wearing a helmet, but still!) and continued up about another 20 feet, very close to Jake. And then got stuck worse than all the other times. Things had just gone from bad to worse. I got off the machine and screamed a primal scream – Jake said he had never heard anything like it out of me ever before. I knew at this point that we were out of options with my machine, and that things were likely going to get worse. Note: you’ll notice a complete lack of photos from now until much later in the evening. Jake and I talked about this later, and we both agreed that our bodies went into survival mode, and pictures were the last thing in our priority list. It’s interesting to think about that…. At this point I figured it was time to let the folks back at the cabin that we were having problems, although I still thought Jake could get out and get help, or that we’d figure a way out. 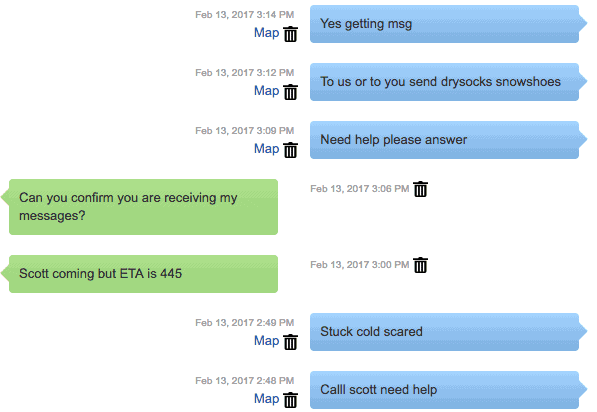 I took out my DeLorme inReach Explorer and sent a message to Josh Mackey and Josh Dyer, both at the cabin enjoying their Monday day off. Josh’s dad Dave was also there – we had come over for a nice 3 day weekend and to enjoy the snow. Note: the below is the text message exchange on the DeLorme inReach Explorer. It is bottom-to-top order with the oldest being at the the bottom, and newest at the top. I have several other screen shots like this throughout the article. 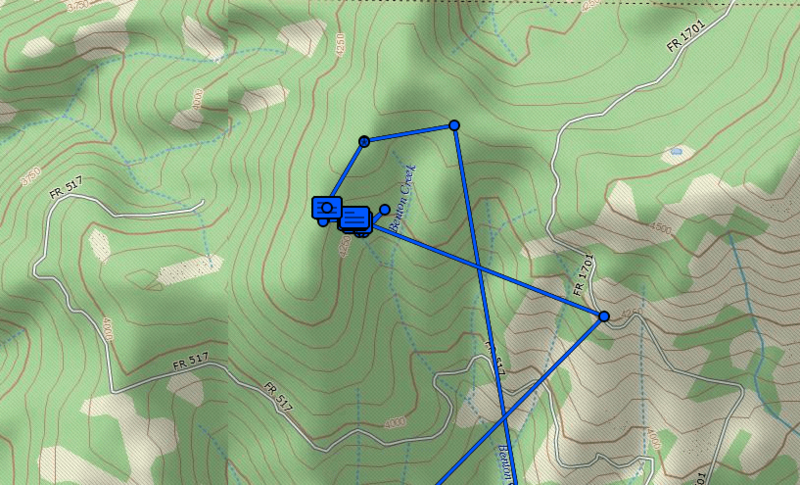 Also, the green is the base camp and blue is me. After a few more minutes of talking options through with Jake, he tried to move his machine to prepare for potentially going for help, and got stuck badly too. It was time to start letting our support folks know that we may need help beyond what we can do ourselves. Scott, my brother, lived 45 minutes away in Yakima. “sar” is Search and Rescue, which was not something I wanted to do if I could avoid it, but I needed the seriousness of the situation to sink in. Dave, Josh’s dad, had to decode what “sar” meant for the boys – they knew things were serious after that! We promised to update them in an hour after continuing to try more ideas to get un-stuck. After another couple failed attempts at un-sticking my machine, I was beginning to run out of energy. I had been running on adrenaline for over 2 hours, moving a 408 pound machine in deep snow and cold temperatures. It was still light outside, and the forest we were in was beautiful, but eerily quiet. Jake got his machine un-stuck, and tried to turn around and head back the way we came, but got stuck again. Clearly the forest did not want us to leave. 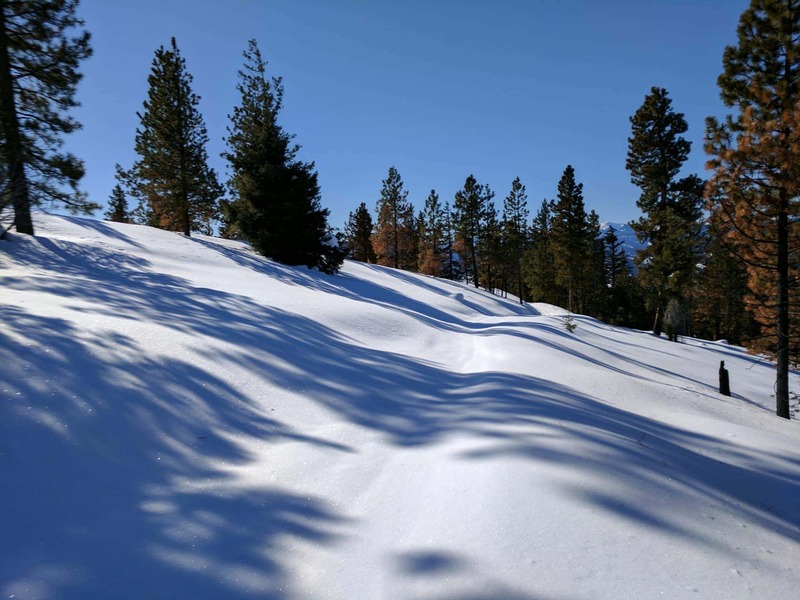 I also had my drone with me, and got that out to see if we could figure out a better way to get out of the bowl, but everything looked like trees and snow. I was able to determine several less steep ways to get out, but we had yet to get our machines moving, so it was not useful information yet. At this point it was time to call for serious help. My feet were getting wet for some reason, and starting to get very cold. I was worried about frostbite, and I knew that we’d be without light by about 4:30PM because of the arc of the sun and shape of the bowl. I told our base camp guys to call Scott – that we needed help. What I think scared me and them the most was the next message. I didn’t mean to type it – it was just what I was thinking, and it freaked them out. I was freaked out as well. 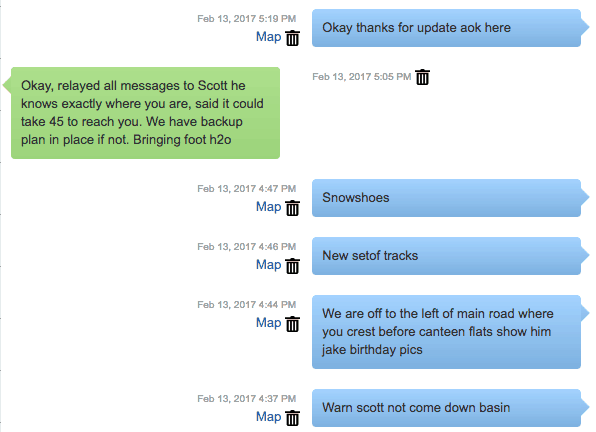 The inReach communicator was also having problems getting a lock on the satellites, which resulted in some of our messages not getting through – something that would happen the rest of the event. Hence the “Need help please answer” message. The good news was that Scott was coming, ETA 4:45PM – we didn’t know if that was to the cabin or to us. I assumed the cabin. We decided to abandon our machines and try to hike out to the top of the bowl. Help was on the way, and getting to an easier extraction point would be best. 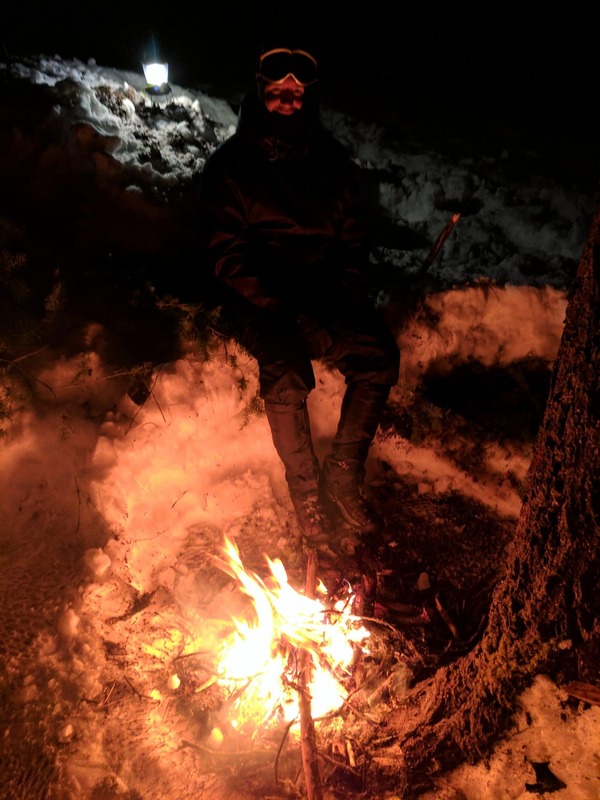 My feet were very wet and cold, and after about 10 minutes of wheezing from both Jake and I trying to move through deep snow, we gave up and decided to try to stay safe and get warm. 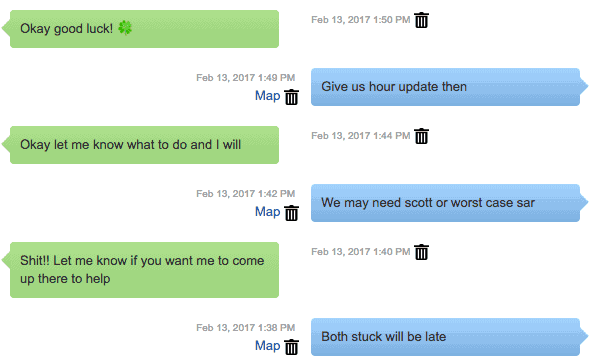 I didn’t believe that Scott would be to us before dark – it was already 3:38PM and it would get dark in less than an hour. After literally crawling to a tree I selected, my Boy Scout / outdoor / survival training kicked in. I selected a very large dead tree with lots of branches that were easy to reach for firewood. It had a large snow berm uphill that would protect us from wind and weather. I was literally almost spent – my feet were starting to show bad signs of freezing, and I could barely do anything significant without needing to rest. All of the efforts I had made to unstick my machine were taking a toll. Jake was a trooper and absolutely essential during this time. He gathered firewood, helped to dig out our shelter, and kept active, allowing me to focus on the fire. With a tiny bit of our emergency toilet paper, a bit of moss, and Jake’s lighter, I had a fire started on the first try. I guess you don’t forget these things after having been forced to learn it when you were 6 by your outdoor-freaky dad. At this point I had a fire going, Jake was gathering wood, help was on the way and things were getting a bit more stable than the adrenaline-fueled last few hours. My biggest worry was my boots. They were new in the last few months, and held up well everywhere else. I had determined that the feet were leaking a lot and soaking my socks. I was in full survival and planning mode now. Besides gathering firewood, making a good shelter was important, as well as taking inventory on everything we had. Scott had a backpack we took with us that weighed in at about 60 pounds, and contained all sorts of useful stuff. Fire starters, emergency blankets, toilet paper, parts for the machines, food, and more. I had added the drone, extra gloves and a hat, and even more food and water. But the best part of all was our savior – the Klim shovel and saw. It collapsed down and fit onto the backpack, but also extended to be a normal-ish sized shovel. Inside the handle was a very sharp saw which we used to cut firewood for hours. It was a lifesaver. In addition to taking care of ourselves, I needed to make sure our rescuer was not going to get stuck, as well as basic info about where we were. The keys were not to come down into the basin, and to bring snowshoes. We didn’t think we could climb out of the basin without them. Base camp confirmed they got everything, and that Scott was on his way and knew where we were. 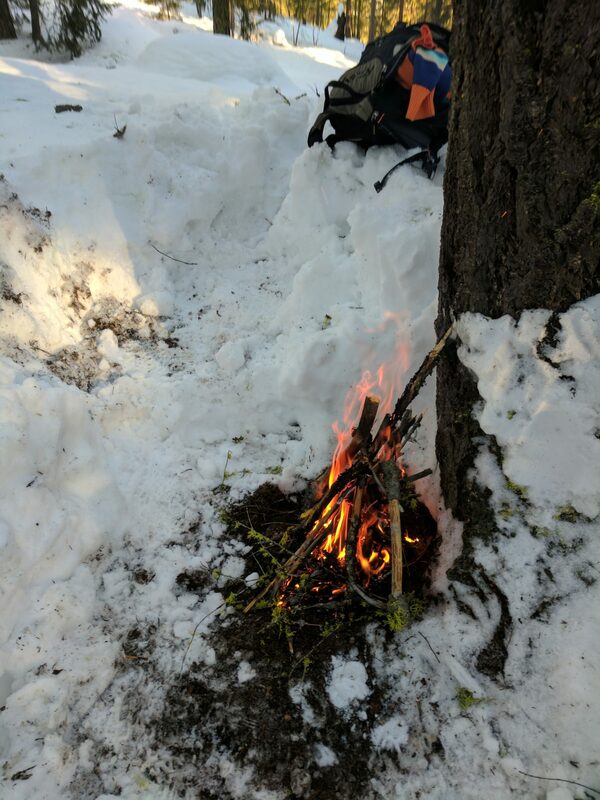 By now it was starting to get dark, but we had a well established fire with a drying rack, and Jake had fashioned a way to use his water bottle to melt snow for drinking. We had taken a full inventory, eaten some granola bars, and drunk a lot of water. 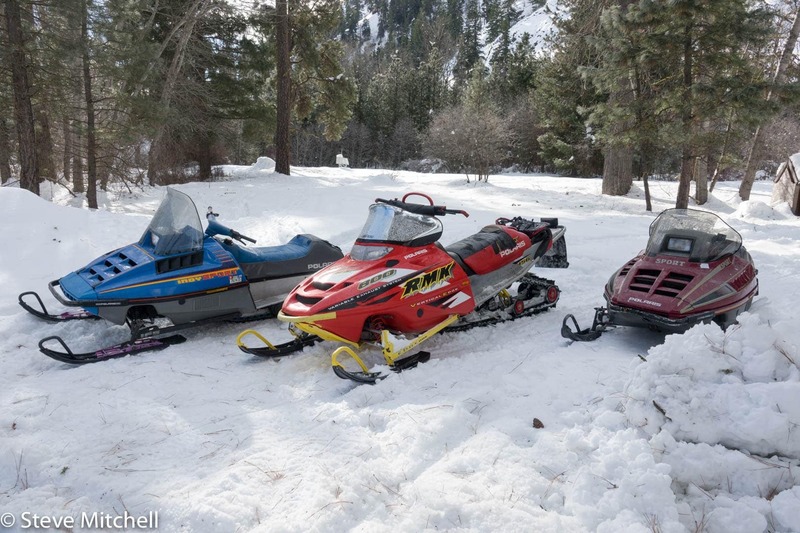 All of a sudden, I heard a snowmobile in the distance, and it sounded like the only one we left back at the cabin – the smaller Polaris 340. After about a minute, we heard it go by and fade. It was still very far away, and we were worried that Scott was in the wrong place and had gone by us! All we could do was continue preparing to be rescued, or to stay the night. Our fire area was pretty nice. I had a little seat you can see on the other side of the fire which was sunk below the snow level. I could sit there and never be exposed to the weather, and the fire heat was reflected all around me. 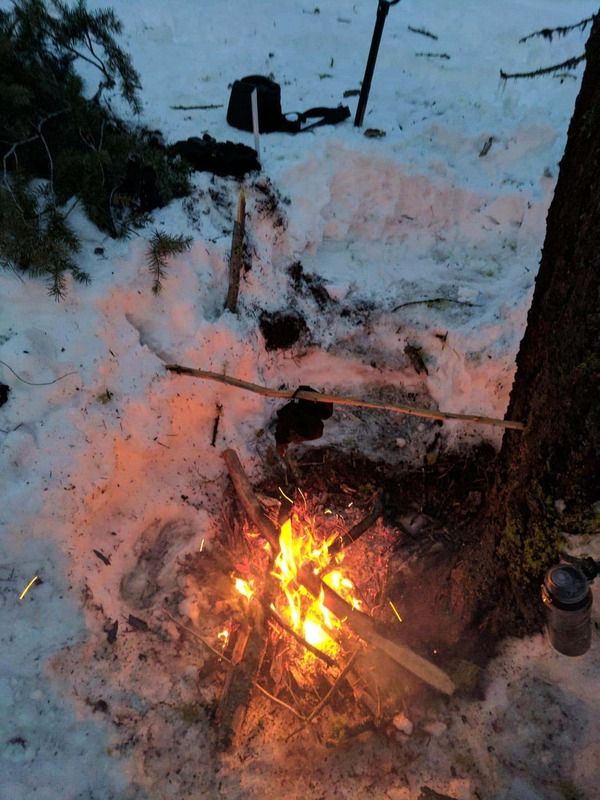 Jake had thinner snow pants on and was getting cold while sitting, so he used some ingenuity from a survival TV show and got some green boughs to insulate his seat. 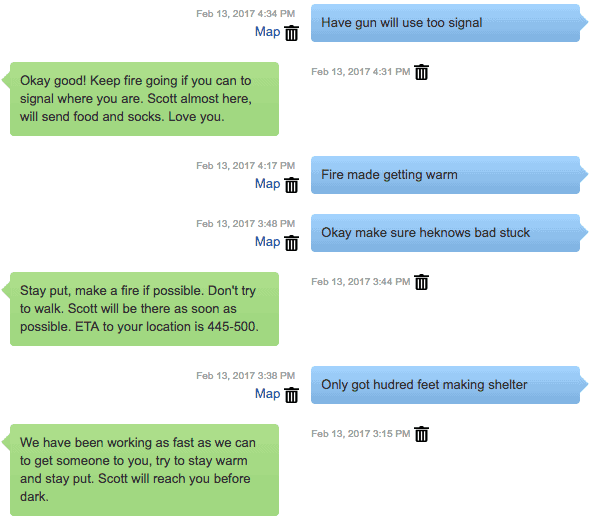 We did a number of other improvements, I took my boots off and tried to dry everything as much as possible, and prepared to try to signal Scott. By now it was pitch black and starting to get very cold. I had already set things out in a very specific order around my seat in case the small headlamp and our cell phones failed and I needed to find something. Our fire was so deep down in the snow – at least 6′ – that there was no way Scott would see it when he got nearby. One of the first things I prepared was the pistol we were carrying, in order to signal Scott once he got closer. We were having problems with the inReach Explorer sending and receiving messages because of the tree cover. I had to walk out away from the fire (remember, deep snow) and it would work after a minute or so. Josh had been trying to signal us to fire some shots so Scott could locate us. 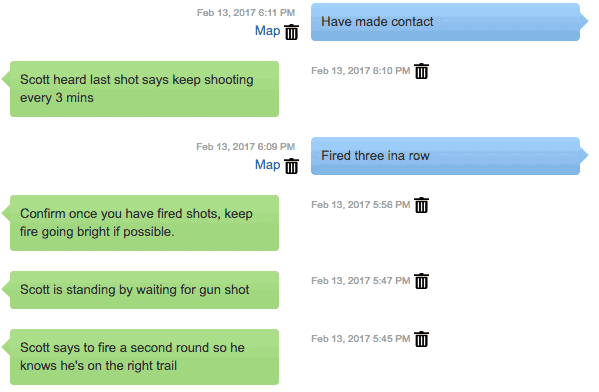 We finally got the message at 5:45PM, and I immediately grabbed the gun, and fired three shots to make sure Scott knew it was us. We waited a couple of minutes, and heard Scott yell in the distance to fire another shot so he could triangulate us, which I did. I can’t tell you how happy we were to hear his voice. A few minutes later he came tromping down the hill on snowshoes with a huge backpack full of food, water, and tools to get things out. Jake used his Samsung phone’s flashlight to guide Scott in. At this point, Jake and I had been out in the elements for 7 hours, 4 of which we had spent working very hard. Scott was fresh and ready to try to get the machines un-stuck. Initially, both Jake and I were a bit confused – why wouldn’t we just walk out of here and come back another time, but Scott insisted that getting the machines out was possible, and – oh yeah – he only had one pair of snowshoes, so we couldn’t walk out. The machines were our best bet out. Scott had driven the 340 snowmobile down our track when we turned off the main road only a short distance. He didn’t think it could make it down that track safely. He then set out on snowshoes down the track, at least 1.5 miles in further to where we were. Even with snowshoes, it was slow going and took him almost an hour to get near us. Then the delays with the inReach meant he sat and waited for a gunshot to make sure he was in the right place. 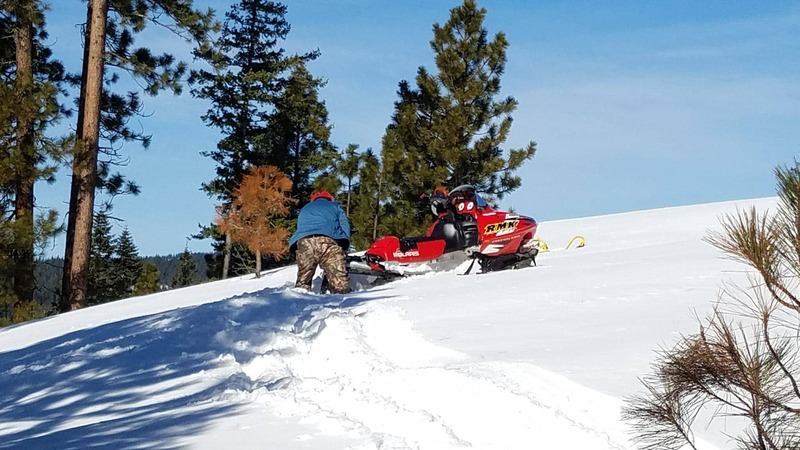 We thought he had gotten to the wrong place because we had heard his snowmobile almost an hour before, and that seemed bad – like he had gone beyond our location. When we got the message to fire the gun, and that Scott thought he was near, I thought Scott was in the wrong place. We got some food and water in all of us, talked about how things happened, and what we thought were the best plans. 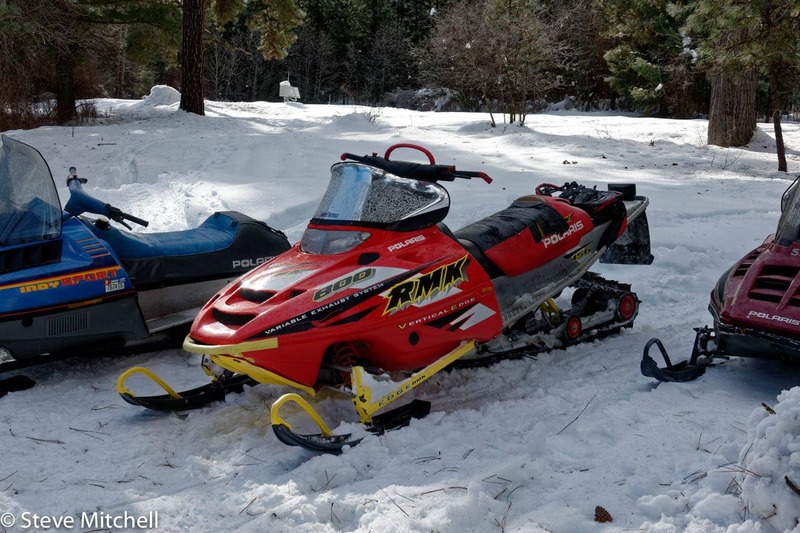 After looking at our options, Scott thought he could get the bigger 800 machine out, but that we might have to drive the 440 down the hill further deep into a ravine that looked scary during the day, let alone navigating it at night. Scott went to work on the 800 machine, and within about 15 minutes, had dug things out and started it up. He immediately drove it right up the hill, feathering the throttle like he was swimming across the big dunes, weaving through tons of trees, stumps and other things, and went right up the steepest part of the hill. As he went up, it looked completely effortless until he hit a big cornice at the top, and the machine almost went vertical, but blew through and disappeared from our view! He said later that it was a huge amount of snow, and then there was a tree and a stump on the other side to thread through before he landed on the top of the ridge. He also said it was the most difficult bit of riding he had ever done! Not something Jake or myself would have EVER been able to do. Jake and I didn’t hear anything for a couple of minutes, so we assumed the worst – that he had blasted through the snow at the top, and disappeared into a hole, or worse that he was hurt or knocked out. A few minutes later he appeared, much to our relief, coming down towards us on snowshoes. He had fallen in a tree well while getting back down to us. It was now 7:10PM and we had been in the elements for 8 hours. It also was getting very, very cold, very quickly. Water was freezing no matter where we put it, a Diet Coke I had froze even faster. Our breath was frosting out in front of us no matter how close we were to the fire. If we had to stay the night, we were definitely going to need a lot more firewood, and a lot more shelter. Jake and I both started working on the firewood and shelter problem, even though Scott got one machine out. We still didn’t have enough machines close by to transport all of us, so I was resigned with having to stay for 2 more hours while Jake and Scott went back to the main road and came back for me later. Scott had a ton of energy, so after resting a bit, he went to work digging a path for the 440 over to our original track. Both Jake and I were amazed at his energy – he dug for almost 30 minutes nonstop! At least 75 feet of path in deep snow over to the original track. Typing on the inReach was getting hard to do with the cold, as evidenced by my wonderful penmanship. I usually use a paired cell phone via Bluetooth, but that wasn’t working for some reason. I also doubt the phone would have worked for long in the cold. A few days before my iPhone shut itself off when I took it out in 15F temps. I was also worried about the three guys back at base camp. We had all planned on leaving at 4pm to get back to Seattle and our jobs. But they’re all good friends and were never going to leave while we were in danger. Scott came over after his epic dig and dropped off the snowshoes – I would be using these to get out with the heavy pack after he drove the 440 out. He was nowhere near as confident in getting it out as the 800 but we had to try. After a quick rest, he went back to the 440, fired it up, and got ready. Jake and I began packing our camp up in the hopes that we could start hiking. A few minutes later, Scott drove the hell out of the 440 up a hill that should have never allowed it to leave – right up to the top. After a big whoop of elation from all of us, and him letting us know he was OK, we had all of the machines out and up on the top of the ridge. Now it was our turn. We had been in the elements now for almost 9 hours, and were beyond tired. We faced a 500 foot hike up a very steep hill in some of the deepest snow I have ever been in. After putting out the fire, and making sure we didn’t leave anything critical behind, it was time to go. Jake had great boots, gaiters, and snow pants and was warm and dry. I had leaky boots with wet socks, so I won wearing the snowshoes and carrying the big pack, along with a great little headlamp. Jake offered to take our two helmets, as well as the LED lantern you see in the pic above of him at the fire. After a few hundred feet, it became clear it was going to be an epic hike up this hill, especially for Jake, who was post holing into the snow every 3rd step up to his waist. Leave it to Jake to come up with a unique way of solving this – he tied his ski goggles around his neck and hung the lantern on them. Then he used the helmets on each hand like a snowshoe, and he crawled on his knees the entire way up the side of the hill. I don’t think I have hiked as hard as I did going up that hill since my early 20s. I was seriously worried about not being able to make it up the steep parts, or having a heart attack or worse. How the hell Jake did it on his knees behind me is beyond me, but he kept up with me most of the way. Making it to the top was so sweet, so rewarding that even thinking about it now brings tears to my eyes. Both Jake and I hugged Scott, who was sitting on the 440 waiting for us. We were out of the hardest part of this long, nightmarish day. I dashed out a quick message to the base camp to let them know we were out. They’d also see our tracker move, as I had set it before leaving this morning to update the map every 10 minutes. Jake took one of the packs, got back on the 440 and rode down to the 800 which was about 1000 feet away. Scott stumbled through the snow without snowshoes while I carried the other pack and snowshoed down to the 800. We both got on the 800, and started the mile-plus drive slowly back to the smaller machine Scott left at the main road. Driving back along my track I saw how deep the snow was, and how erratic my path was. It was clear that I was in over my head when I came down this way. We made it out to the main road, I kept the 800 since I had ridden it up and was familiar with it, Scott took the 340, and we began the 45 minute trip down the winding road back to the cabin. The trip back is mostly a blur – it was really hard to drive as it must have been below 15F and everything froze. The trail had not been groomed in weeks, and was bouncy as heck. I don’t know how Scott and Jake fared as I had the cushier machine – it must have been a lot of bumps! Scott did take the time, as he was in the lead, to have a fun ride, and went up and down the sides of the main road, hills, and other things on the way back. What a crazy guy. 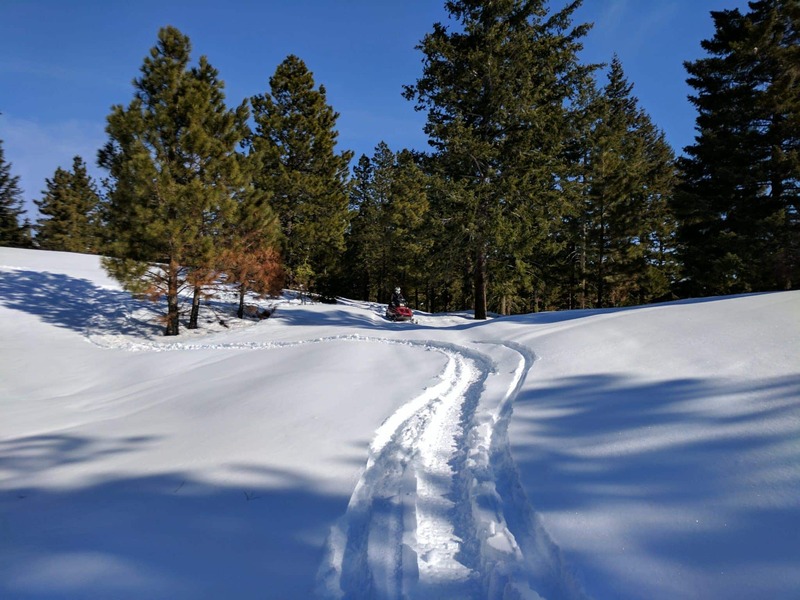 As we came down the last section of the trail, high up on the mountain, we could see down to the cabin, and the snow monster that the guys had made two days before out of snow and Christmas lights – it was beautiful. We still had to cross Highway 410 and navigate through some trails back to the cabin. As we were doing this, the resident elk who have been eating alfalfa hay we had put out were spooked from their sleeping spots. Scott and I saw them and they went away from us. The biggest one veered towards Jake who was at the end of the line, but stopped just short of anything bad. Can you imagine surviving this whole ordeal only to be kicked in the face by a elk!? We arrived to hugs and help from our three base camp coordinators. It was wonderful to give my husband Josh a big hug – he had been worried beyond belief that we would be hurt or die in the mountains. Everyone hung out for about an hour and talked about the ordeal. Scott had to go home to his family, and we all thanked him profusely. We found out later that he loves doing this sort of stuff, and goes out at night frequently. Any excuse to go tromping around and a bit of danger is not something he can turn away from. I have to say that I’m cut from the same Mitchell cloth – my domain is the sea and boats, though. To each their own. Our snowmobiles ended up saving us in the end. If we had to walk out to the cabin, it would have taken us several days, even if we could have made it through the deep snow. Scott was right to insist on trying to get them out as the fastest way for us to get home. From left to right above, the 340 was the one Scott rode up to save us. The 800 is in the middle, and the one that caused the majority of my problems. The 440 is Jake’s and on the right. We were out in the elements from 11:00AM to 9:00PM – 10 hours. That’s a long time to be out and about in 20-15F temps! You can see my path down the road on the top of the ridge, and then the updates and messages while we were trapped in the basin. 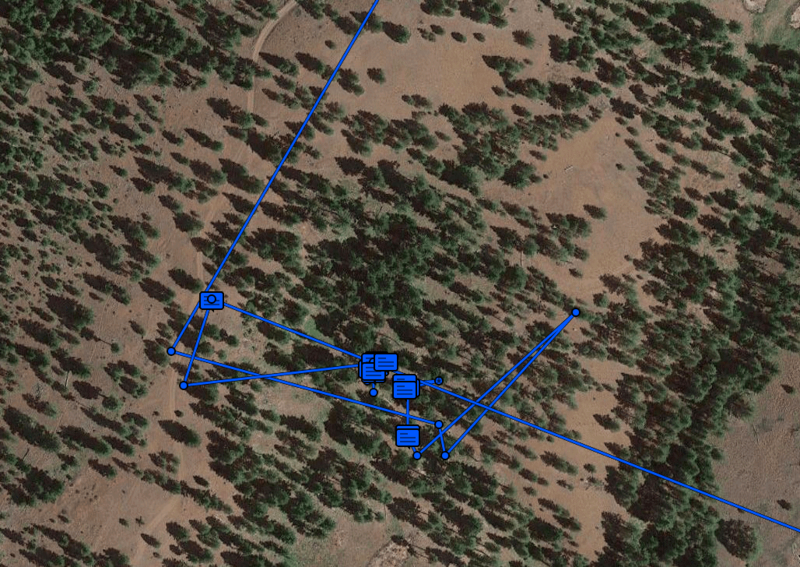 Because of the trees, the GPS location moved around a bit – we did not / could not move that much. 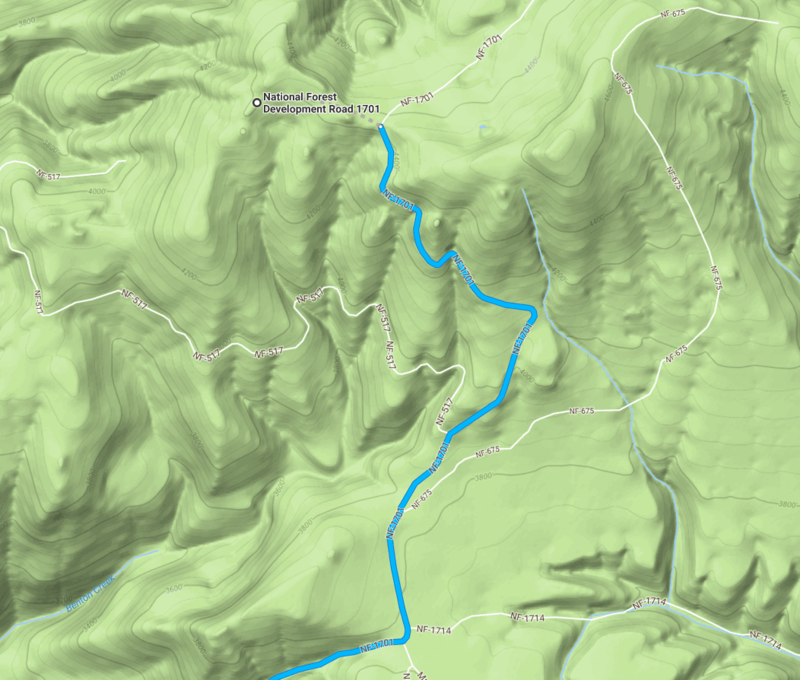 The topographical map really shows the elevation change – we estimate we had a 200 foot elevation difference between where we were and the top of the ridge. Try climbing that in deep snow at 8PM at night when you’re tired! Novice riders in deep snow – we went out the day before, and gained false confidence. In the future, we should make sure the snow is manageable for our riding capabilities. Separating when I was trying to turn around – we should never have separated that far apart. It meant Jake had no safety equipment or way to contact anyone, and he couldn’t know where I was when he started following my track. Not bringing more safety / clothing in case we were stuck overnight – Jake should have had his own safety equipment, and we should have had more clothes. Turn around when you think it’s not safe – I should have turned around right where I was instead of going down a deep snowy road. Even if it meant an hour of digging and lugging the machine around. 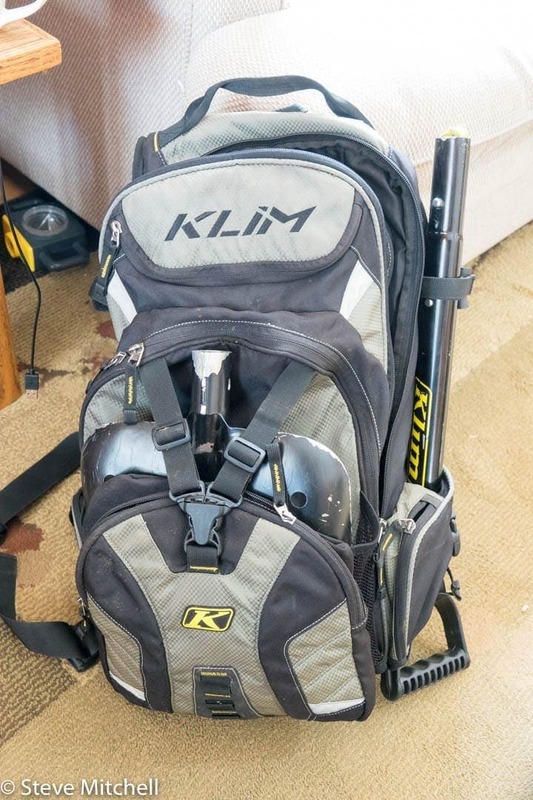 Base camp – we should have educated our base camp folks as to the seriousness of a call, and certain terms or things to do if we were in trouble. Example was using “sar” which the boys didn’t get, but Dave thankfully understood. Safety equipment – we had good safety equipment including the shovel, pistol, DeLorme inReach, and many other items. Many people I know who go out in the wilderness have taken far less. Food / water – we had enough food and water if we stretched it for 2 days. Communicator – the DeLorme inReach Explorer was our lifeline to our team at the cabin. It gave us hope, and let us get help fast! Worked together & stayed calm – sure we had some stressful moments, but overall we knew we could take care of ourselves for as long as we needed to. Called for help – when we knew we couldn’t do things on our own, we called for help. 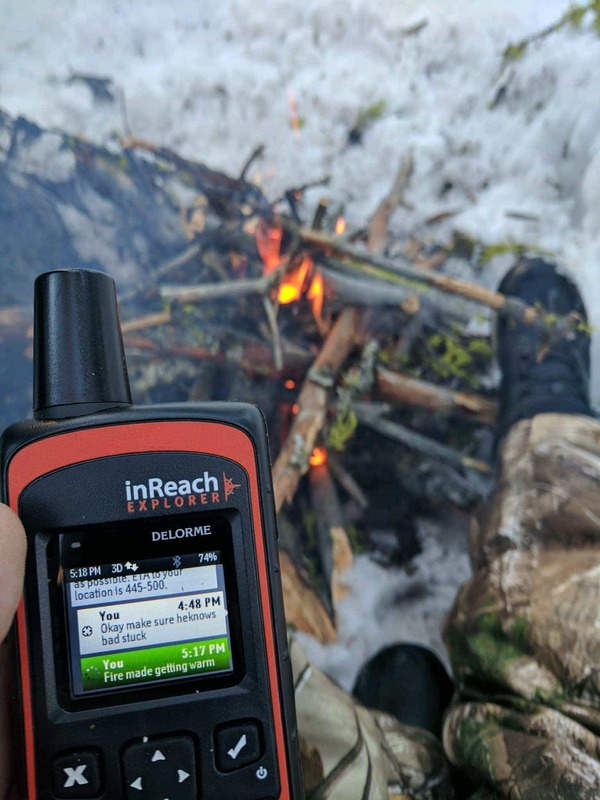 DeLorme inReach Explorer – by far this was our biggest savior – we could communicate with anyone we needed to and let them know what was going on. They could track our GPS location on a map, and send messages back to us. Worst case, I could have pushed the SOS button and had Search and Rescue come and find us. Even after being used two days in a row, and sending tons of messages while we were being rescued, the thing had 70% battery and said it could last another 5 days sending updates! 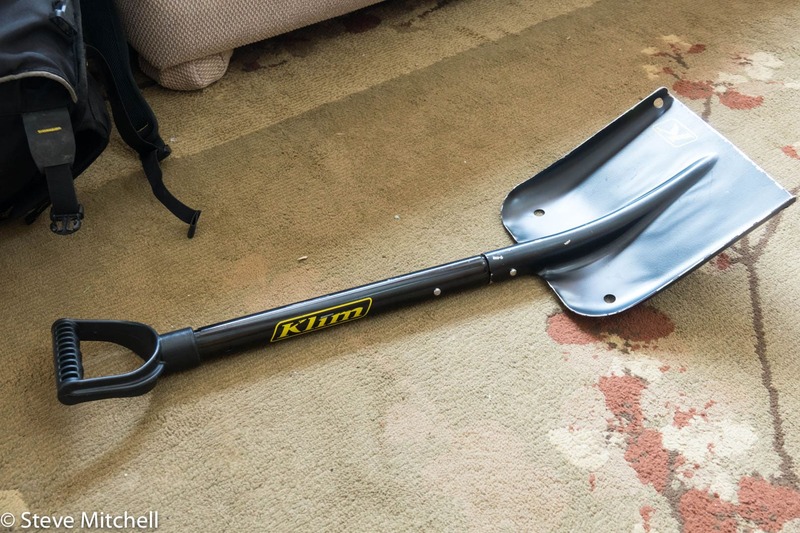 Klim Back Country Shovel system – this thing was the best tool we had on hand. It shoveled hundreds of pounds of snow, hollowed out a space for our fire, and got all of the machines un-stuck. The saw inside cut all of our firewood and kept us warm. 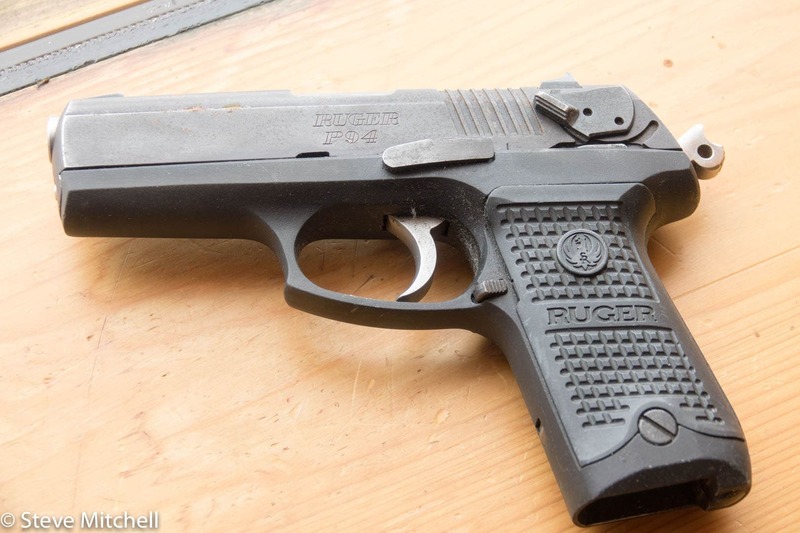 Ruger pistol – both for protection and signaling, if you go out in the wilderness, a pistol is a good thing to have. It gave us peace of mind the whole time we were up there. My crazy brother – for jumping in a car, then a snowmobile, and then hiking out in the wilderness in the dark to come rescue us. We can’t say enough about how much we love him. I’ve been stuck out in the elements overnight many times before – in all seasons and both on land and sea. Most of these were because of getting lost, or weather related. Growing up in a family that hunted constantly and took crazy long outdoor vacations meant that I had to learn survival skills, and they have come into play many times in my life. Being a Boy Scout also helped hone these skills. I’d rank this experience as one of my top 5 risky experiences ever, which is saying a lot. We had the potential for major injuries at many points of the ordeal, along with serious weather and temperatures. Had we not had the communicator, we would have been completely on our own, and had to wait for rescue far longer. There was a lot of uncertainty about being rescued, and how we’d get out and safe. Never at any point did I think we would die, but I was worried about our stamina and staying power if we had to stay the night. Multiple friends have commented before on my redundancy, and my technology gadgets that help with these things, like the inReach Explorer. Some of them questioned why I had those things, or why a float plan (for the boat) is necessary. After this experience, they have completely changed their tune. Being prepared isn’t something you do randomly – it’s part of your DNA. The biggest moral of this story is just that – Be Prepared. Whether you are at home, on the water, or in the mountains, make sure you have what you need to survive should the worst happen. I always try to, and it’s saved my life multiple times. I’ve been flying drones for about 5 years. There are beautiful vistas and opportunities while sailing, and a drone is fantastic to include in your toolkit. The Mavic Pro is perfect for a sailboat.